Do you still remember the super affordable Nokia 105 that was launched earlier this year? Well, say hello to the newly announced Nokia 108 – yet another addition to feature phone segment from the Finnish phone maker. For just around RM 96 (USD 29), the Nokia 108 is packed with plenty of features within its 13.5mm chassis. We are looking at a VGA camera, support for microSD card with capacity of up to 32GB, FM radio, MP3 player and Bluetooth 3.0 connectivity with Nokia SLAM tech. The Nokia 108 also comes with a slightly bigger colour display than Nokia 105 at 1.8-inch. Of course, long-lasting battery life is another trait of feature phones. Nokia stated that the single SIM variant of Nokia 108 features a standby time of up to 31 days while the standby time is reduced to 25 days for dual SIM version. In terms of talk time, both variants are able to last for up to 13.8 hours together with maximum music playback time of 40.8 hours. 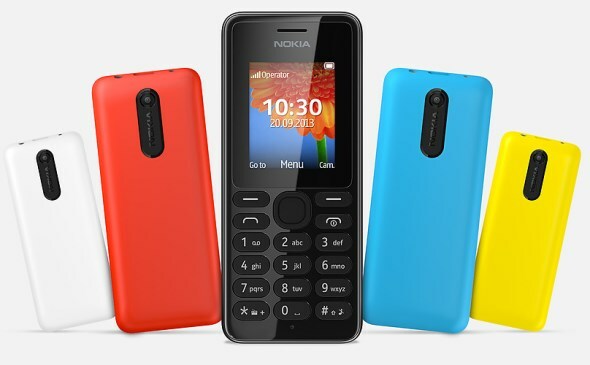 Available in red, black, white, yellow, and cyan, the Nokia 108 will be heading to stores throughout the world in Q4 2013.